WANG Lei, ZHANG Ying, CAI Ailu. Discussion on the Values of the Inlet Diameter of the Ductus Venosus in Normal Fetuses during the Second and Third Trimester[J]. Journal of China Medical University, 2018, 47(7): 601-603. Abstract: Objective To establish ranges of the inlet diameter of the ductus venosus (DV) in normal fetuses during the second and third trimesters. Methods Color doppler ultrasound was used to examine 250 normal singleton pregnancies at 18-40 weeks of gestation. 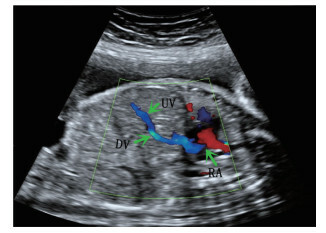 The color was removed, the inlet diameter of the DV was measured on the two-dimensional gray-scale image, and its relationship with the gestational week was analyzed. Results At 18-21 weeks, 22-25 weeks, 26-29 weeks, 30-33 weeks, 34-37 weeks, and 38-40 weeks of pregnancy, the average inlet diameter was 1.2±0.2 mm, 1.5±0.3 mm, 1.7±0.3 mm, 1.9±0.2 mm, 2.0±0.3 mm, and 2.2±0.3 mm, respectively. The inlet diameter of the DV was correlated with gestational age(r=0.7, P < 0.05). 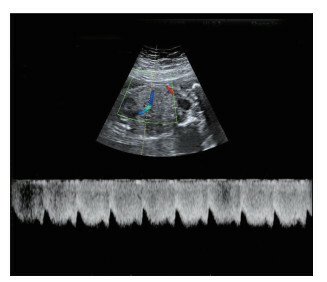 Conclusion It is possible to observe the DV and measure its diameter during the mid-second trimester. The range of the inlet diameter of the DV may be useful for the early diagnosis of DV-related disease. The inlet diameter of the DV increased with gestational age. POKHAREL P, ANSARI MA. Fetal ductus venosus pulsatility index and diameter during second and third trimester of gestation[J]. J Nepal Med Assoc, 2017, 56(205): 124-131.